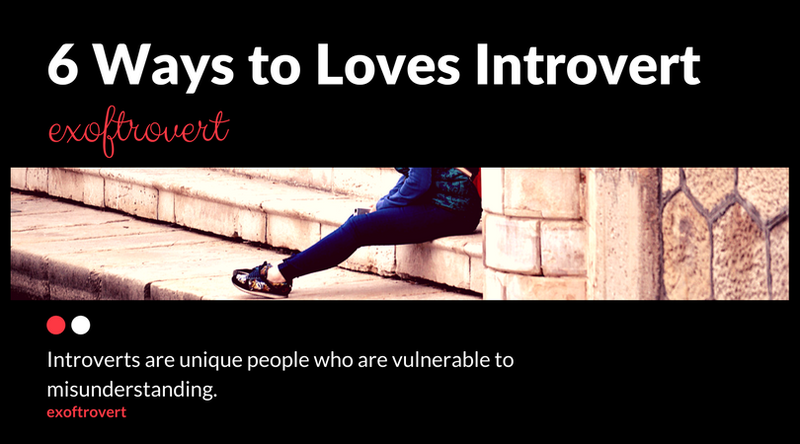 6 Ways to Loves Introvert - Introverts are unique people who are vulnerable to misunderstanding. Because it takes longer to feel comfortable with new people, they are often labeled loners or even arrogant. Even some get the initial impression with fear. Read More: How to Get Closer with An Introvert? In fact, the introvert is also the same as other humans. They want to be close to the people around them, also want to feel happy. Making them feel cared and loved is actually simple; You simply understand the "default characters" and treat him according to his character. Here are what should you understand about the introvert. Talking with clear (to do point) is the way they like more. An introvert does not mean you do not want to talk to you at all. They are just more comfortable with meaningful conversations. So, you do not have to be polite when talking to him. Just point to what you are really interested in talking about him. In addition, maybe you can accompany him to eat while waiting for his mood to come out. Making an introvert happy is not difficult, really. You just need to make her feel comfortable. If he is still, do not force him to reveal what he has in mind. Maybe he's having a lot of trouble, so go to him with little to say. You don't have to ask a lot of questions like "So what?" or "What do you feel like?" Because this kind of question can make them feel uncomfortable. If they are comfortable talking to you, they will tell you anything. Privacy is a valuable item. So don't ever break down his personal space if you want him to feel happy. For introverts, privacy is an absolute must you respect. If you forcibly rummaged through his world, he would just retreat slowly. Well, for him to feel appreciated try to get used to asking permission first if you want to know more about his life. Make sure you pocketed his permission when you want to come to his house or just check his handphone. After all, he actually will easily let you. If you come to his house all of a sudden, he may be feeling unprepared and embarrassed not to look good or neat in front of you. Therefore, rather than giving a surprise, you better permit first. The introvert doesn't always mean quiet. They're just waiting for the right moment to express their thoughtful thoughts. You do not have to force them to tell what's in their head all the time. Introvert people do not talk too much, but they are used to thinking deeply. Not infrequently this also makes them self-sufficient problems that they experienced. Perhaps you are concerned about it, then you will force her to tell it to you. Instead of helping them solve the problem, sometimes you just make them uncomfortable. Introvert's minimal talk does not mean they do not want to be cared for, they are just busy thinking and arranging as well as possible sentences that will be spoken. Well, if they're got the timing and mood to open the voice, then he did not hesitate to talk at length. Often he will issue a quality opinion because of a deep thought. So, if you want to feel loved, you can be a little patient. The introverts are good listeners. So you must listen to it well and stop cutting it off. An introvert will think long before they speak. They will be engrossed in their own feelings and thoughts. Well, if they're already started talking, that's the phrase they think is the most valuable and fitting. So stop cutting the sentence down the middle of to make them feel good. So listen carefully to what he wants to say, when you have finished talking, you can only respond. In this way, an allegedly rare introvert will feel appreciated and loved. Forcing him to decide something immediately is very excruciating. One way to make them feel loved is to give them the world, that is to be alone and think deeply. Maybe you want their opinion on your plan, then give their time to think about it. Maybe you need their approval before you want to change jobs, then ask them to consider it from long ago so they do not feel pressed to answer immediately. Introverts do not necessarily directly provide answers with a steady because they take the time to think carefully. They will think in detail the risks of every decision they makes. In addition, if you want to give them time to think, he will not rarely give the most quality response. So what they did was not a momentary emotional response. Treating him as an introvert not only makes him feel loved, but also fully accepted. Being an introvert does not mean they are not good, they are the leader of the future leaders. Their calm, quiet-spoken, and non-adventurous nature is an advantage to being able to make their love in a simple way. Without having to take him to a party or give a big surprise, you can be their most dependable life partner.